This page is still challenging. I am still open for questions. If you missed the first page of this puzzle proof, it can be found here. If you missed the second page of this puzzle proof, it can be found here. Again, it is essential that the bracketed Boolean, in this case a standard Y wing, or xy wing, fully forbid the weakly linked condition - in this case h2=6. Also, that the Boolean exists when the strongly linked condition is false, in this case, g7=9. Again, the logic is basically the same as all the other complex forbidding chains used in this proof. Finding this one is almost a self-fullfilling prophecy. The easiest eliminations that I could find cleared away much debris from cells g7,h9. Thus, it was natural to look for a way to use the remaining possibilities there in a chain. The worst is over. But there remains another very interesting step. Almost Coloring, Almost Locked Set, all within a forbidding chain - again! Note that c5=4 lies at the intersection of four strong links, (one bivalue, three bilocation). This makes c5 a very likely focal point for some sort of chain. The trick of letting the fc on 4s prove a cell is true is also nothing new. Many times, one can do this even with standard chains. In this case, one could have written the fc on 4s to either forbid a4=4 or c8=4. But, in either case, the strong links; a4 == c5, c5 == c8, would eventually need considering. Thus, the manner in which I choose to write the chain seemed most efficient. Nevertheless, what I saw was more like a conditional sky scraper plus an ALS, with some linkage between them. After d5≠4, quite a few cells solve. 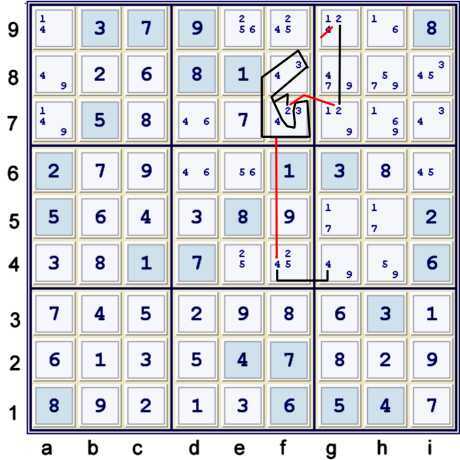 The entire bottom third of the puzzle grid is reduced to naked singles. Nevertheless, this puzzle is resistant still. Any time during this process, one could have used the Almost Unique Rectangle formed by f8=34, i7=34 and the strong 3s at fi78. 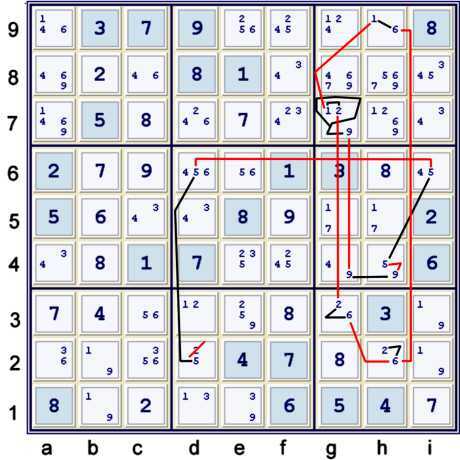 I have chosen not to do so because I prefer to prove the solution is unique, and because it did not seem to advance the puzzle significantly. For example, if one had used the AUR, then e8≠4 => e8=i7=3. The chain above would become a standard Y wing style using only three native strong inference sets. I found such nominal help failed to justify the price of using the AUR. 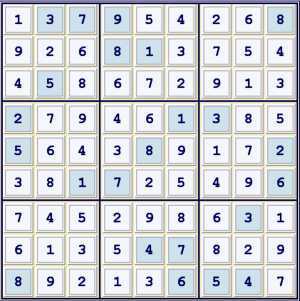 It is rare that this late in a puzzle, one would need forbidding chains. It is even more rare that one could still use a naked quad. Finally, it is rarest of all that the naked quad can only be replaced with a hidden quad. This late in the puzzle, one would expect perhaps a hidden pair versus a naked quad. But, I suppose, this one is meant to be difficult, even when doing the easy stuff! After making the eliminations justified by the Quad shown above, a8 = 9% row, column & box. The chain illustrated above at least has some sort of pretty symmetry to it. I suppose that makes it a fitting final chain for this puzzle. 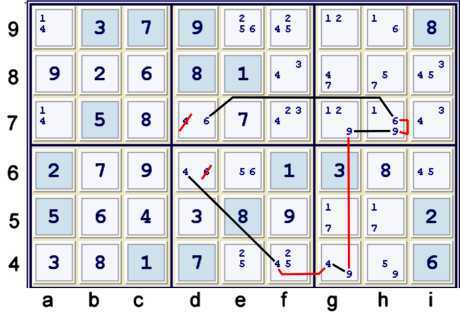 With the puzzle almost reduced to just 4 boxes, there are possible chains everywhere. I did not spend any time looking for efficient ways to finish this one off. I just wanted to get it done! The chain above should be self explanatory, if you have made it this far! Almost worthy of the label: unsolvable. I shall not fully illustrate proofs of such puzzles very often, as it consumes both more time and more effort than I intend to expend. However, I really wanted to demonstrate using Almost Forbidding Chains, or Almost Alternating Inference Chains. This puzzle seemed like a good one to use. Kindly place any comments or questions about this proof on the page where the question arises. I receive automatic notification of you comments, so I shall find them. Eventually, I will even answer them! This is certainly one to study. 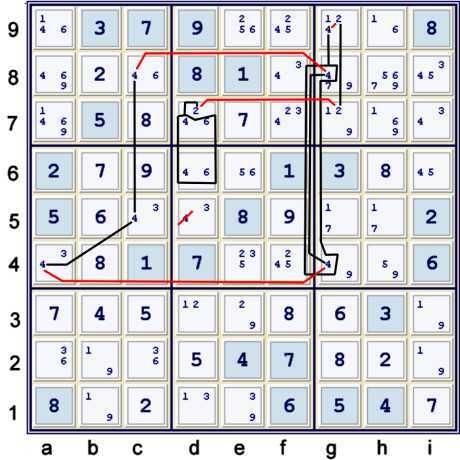 Looking for Almost Forbidding Chains, Almost Coloring Chains as well as Almost Locked Sets should prove very helpful on puzzles such as these, providing one can find them! I know precisely what you mean. Only if someone can actually reproduce the logic used to completely unlock the puzzle, does the comment 'easy' hold some weight. But where's the challenge in that?